For Job Seekers who would like to use native language skills other than Japanese in the work place. We support non-Japanese job seekers with finding excellent working opportunities in Japan that best fit your skills and experience. Any foreign individual over the age of 18, living in Japan with a valid visa allowing work in Japan may register with Tempstaff at any time. To register please complete the on-line PERSOL TEMPSTAFF CO., LTD. Registration Form. After finishing registration, Tempstaff will introduce to you jobs that suit your working experience and preferences. You will also receive latest information concerning working opportunities by email. * It is also possible to introduce jobs in other areas depending on availability. Tempstaff can provide language support to job seekers in English, Chinese and Japanese. Tempstaff always looks for new jobs that can better utilize your skills and experience. Tempstaff can assist with visa renewal procedures (depending on eligibility) to current staff free of charge. Employees can benefit from social insurance and employment insurance whilst working for Tempstaff. If you have any concerns about work introduced by Tempstaff, our native coordinators are able to respond in a timely and sensitive manner to your needs. 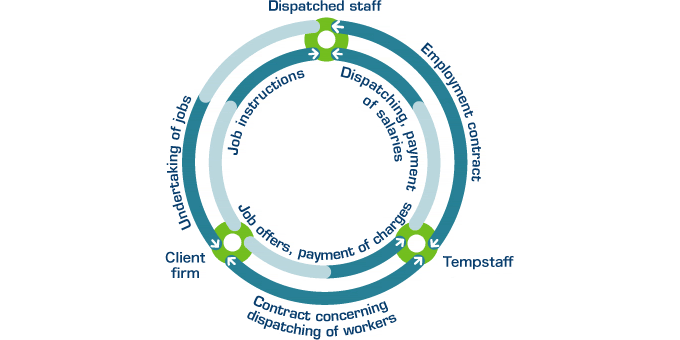 Worker dispatch business involves three parties - temporary staff, client firms and Tempstaff. 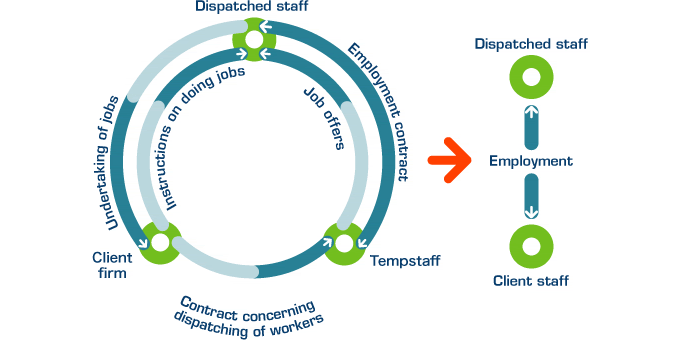 Temporary staff enter into an employment contract with Tempstaff. On acceptance of the contract, the temporary staff are sent to the assigned client firm by Tempstaff, where they are given instructions concerning their jobs by that firm. They are paid salaries by Tempstaff. The advantages of this type of service are that you are able to choose the duration, time and location of your job that best suits your lifestyle. Under the Temp-to-Perm system in our staff members are sent to workplaces first as temporary staff for a fixed period, but with the intention of becoming a regular or contract-based direct hire employee at our client company. The temporary staffer will switch to a direct-hire contract at the end of the fixed temporary service period, provided the temporary staff member wishes to continue working at the client, the client company also wants to continue working with the staff member, and the two parties have agreed upon the employment conditions. The benefits of Temp-to-Perm for job seekers is that they are able to try out the job in a temporary capacity, before needing to make a long-term commitment to the company. Client companies are also able to check that candidates are a good match for their company before hiring contract and regular employees. Contact Tempstaff, Career Center. Universal Team.